Growing yongchak is excellent business today. A tree can provide an income of about R1.5 lakh in a season. A family that has a few trees need not do anything else for a living,” says Jeena Sorokhaibam, founder of Lookacteast Kitchen, a Delhi-based eatery that specialises in Manipuri cuisine. Four to five pods sell for R100 in Manipur and a tree produces more than 15,000 pods in a season. Also called bitter beans, twisted cluster beans and stink beans because of its peculiar smell, yongchak is a semi-wild species that grows in the backyard and concerted attempts to cultivate it have not happened. Yongchak flowers and beans are part of many delicacies, but it is the pods that are most commonly eaten. “Yongchak pods are available from October to March. This is when the beans inside are just developing and the pods are tender enough to be eaten raw as crunchy salad, or shingju. By March, the pods are mature and have prominent black-coloured beans inside. These are removed and dried to be eaten during the rest of the year. Whole yongchak is also dried and stored,” she says. My initiation to these pods was at Pusa Agri Fair held at the Delhi-based Indian Agricultural Research Institute in March 2018. At the fair, the pods as well as a yongchak pickle was displayed at the Northeast Centre. The pods looked like the phalis of the Gulmohar (Delonix regia) and piqued my curiosity. Though yongchak is associated with Manipuris, it is available in the entire Northeast and even other states, where it is known by different names: sapota in Hindi, shivalingada mara in Kannada, unkampinching in Marathi and khorial in Assamese. Removing the yongchak skin to eat the pod is tedious. It is done using a scraper called yong khot. Then the thick sides are removed to reveal a light tender greenish skin inside. It is like broad beans or sem but of a slightly lighter colour. If yong khot is not available, metal tongue cleaners or metal bottle wrapper can be used. The sides, which are harder, are then removed using a knife. The pod can be chopped and used alone or in combination with other vegetables to prepare delicacies. Yongchak is not usually boiled because it becomes a mash and loses its taste. The trick is to parboil by pouring hot water on the tender portion and leaving it for a minute. Yongchak is extremely nutritious. Tree Bean (Parkia roxburghii): A Potential Multipurpose Tree Legume of North East India, published by the Indian Council of Agricultural Research in 2016, says that the flowers, pods and seeds of this plant are a good source of protein, fats, carbohydrates, minerals and vitamins. Yongchak is also a good source of ascorbic acid and is said to cure stomach disorders and abdominal colic. 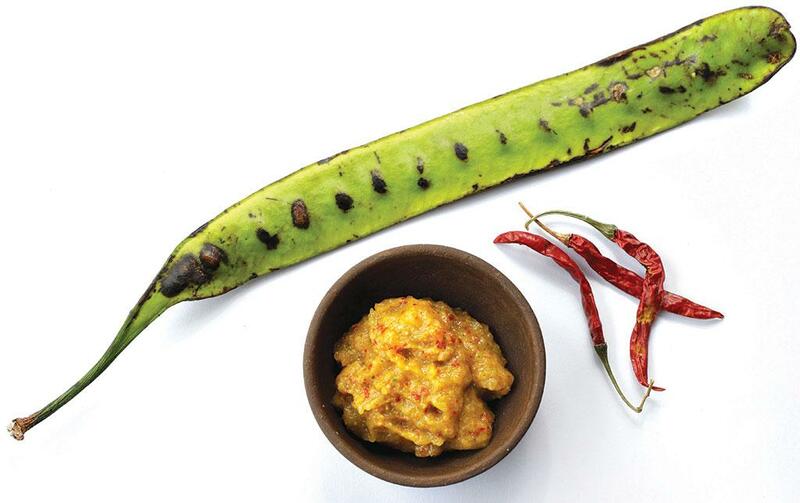 “The pods of P timoriana are considered as a delicacy in north-eastern states in India and Southeast Asian countries. Owing to its nutritious pods, wide adaptability in different soils in varied altitudes, if properly exploited P. timoriana can be considered as a supplementary source of protein,” states a paper published in the journal Genetic Resources and Crop Evolution in February 2018. “Besides its immense nutritional values, P timoriana is reported to have anti-oxidant, anti-bacterial, antidiabetic, anti-prolife-rative and insecticidal properties,” the paper adds. The skin of the pod is also used for dyeing. “Manipuris love yongchak beans. They are eaten across castes and communities. Earlier, Imphal had a lot of these trees, but today it is procured mostly from the hills,” says Sorokhaibam. “Dowry does not exist in Manipur but wealthy families or those with agricultural background gift yongchak to their daughters during weddings. She gets the income from the tree once it starts to bloom, which usually happens in five to six years,” she adds. Scrap the yongchak to reveal the green inside. Cut it fine, add to the chopped potato, beans, chilly paste and salt. Put it in a pressure cooker and cook for two whistles. Let it cool. Fry the onions and chives. Mash them with the cooked vegetables for eromba. Generally, this is cooked along with fermented fish. The fermented fish is steamed or boiled in a different vessel. Heat two drops of oil in a pan/pressure cooker. Add fermented fish and fry for some time. Add crushed ginger, chopped onions and chives. Saute for some time and add turmeric. Again, saute for some time and add yongchak, chopped potato, peas, dry fish and red chillies. Now, add salt and water and boil for five minutes if you are cooking in a pan. In pressure cooker, cook till one whistle. Garnish with finely chopped coriander leaves. A vegetarian option could be without the addition of dry and fermented fish.